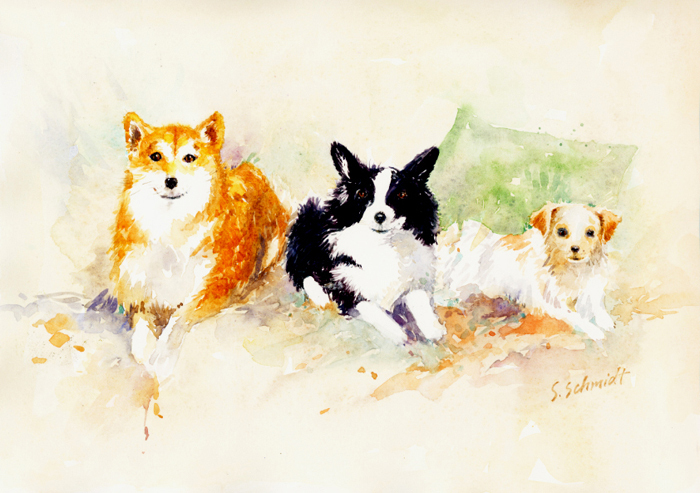 A few months ago my husband told me our friend Mick from the local coffee shop wanted me to paint a portrait of his three dogs. It was to be a gift for his wife. This was a surprise since I didn't think Mick knew that I did any type of artwork. I thought it was very brave of him to trust me to do an acceptable birthday painting for his wife's gift. Mick emailed some photos of the three dogs which were taken with his phone. Oh my, not such good references for me to paint from. But after I got started with a good drawing I really had fun painting this. I was very happy to give this to Mick, my first commission. He loved it and his wife was thrilled! I love photos and I always have my small camera with me. All those glimpses of a view, or passing moment, vignettes I happen to see, I want to capture. I'm not a photographer, I just love snapshots. Nowadays I like to take photos with possible paintings in mind. I've had a page on Flickr with some of my photos for a few years. I really enjoy adding to it. 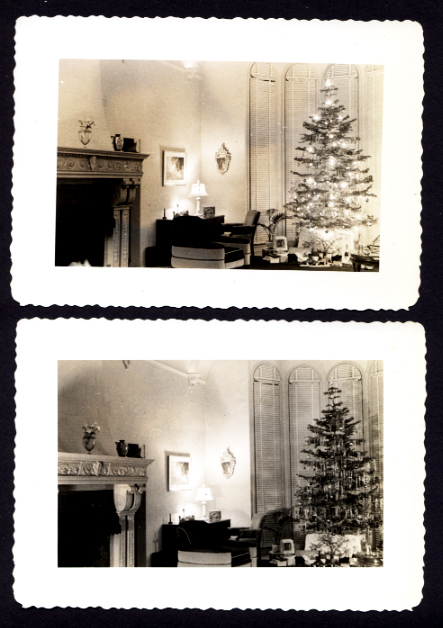 I also have fun looking for vintage images that catch my eye. For many years I've looked through piles of old snapshots at the flea market and ephemera shows. Some jump out as instant favorites. It might be the subject matter or the lighting and values. Here are two that I ran across at the local flea market this month...Christmas in July. All this month I've noticed retailers advertising Christmas in July specials. I love the lighting and tones on these, and what fun to find them together. It was my turn to choose the challenge of the month in a Facebook watercolor group I'm in. I decided on a still life piece for us for July. I chose the still life project because I wanted to try one myself. So for the whole month I've been thinking about possible subjects. Also, I had seen a still life with a dark background somewhere that caught my eye and I kind of wanted to try that. I say "kind of" because I could see how it might go very badly. It finally came together more when I found this pretty fig to paint. Everything was going well with the painting and it was looking nice with the light background that was developing. It took some deciding to plunge in with the dark paint and possibly ruin what I had done. I think the decision to try the dark background turned out okay since the whole setting was dark. I'll try this again sometime. After seeing the movie Moonrise Kingdom which was filmed in Rhode Island, I was inspired to try another painting. I couldn't wait to try a different version of the piece in my "Green Again" post from a few days ago. In parts of the movie it's very stormy and dreary. I had the thought to try a more moody and gray version of the previous painting which had focused on mixing greens. I tried a small ACEO (ATC) size version which is 2.5" x 3.5" just to get the feel of trying to use more neutral colors. This is the finished piece, 8" x 10". It was difficult to put my thoughts into paint and use more neutrals as planned, but I think it does feel more subdued and moody. I always learn something from these pieces. My ACEO idea sketch is below. How about a change from greens! 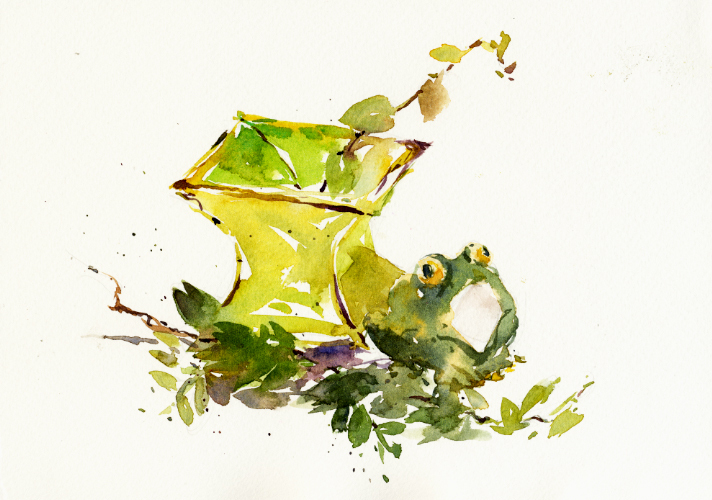 Last fall when the online class I was taking ended and I was ready to learn from some other watercolor instructors, an annual art trade show came around. It's a "Learning and Product Expo" that is held at a convention center only a few miles away from home. The Expo has been going on for over 20 years and I never checked it out. But in 2011 I noticed some artists whose work I was getting to know on Facebook were teaching workshops at the Expo. I signed up. One class I was interested in was Negative Painting with Brenda Swenson. Brenda is the expert at negative painting and does such gorgeous watercolors using the technique. I had to find out how to go about it. Unfortunately, most Expo classes are only 3 hours long which isn't really enough time. So, with Brenda's workshop we only got into doing black and white versions. She had many of her beautiful and colorful pieces posted on the walls for us to see. With the start I got in the 3 hours I had to try a piece in color on my own. 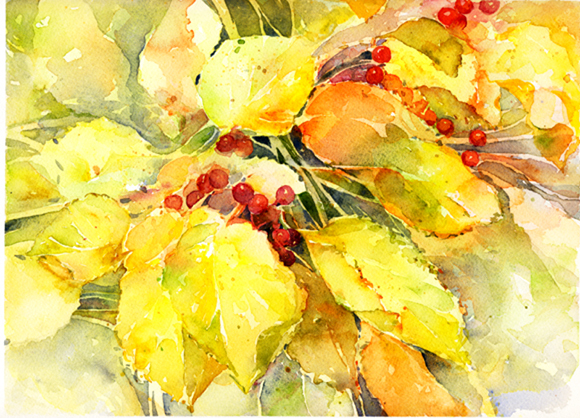 I chose a photo for reference of leaves and berries from the Paint My Photo website. 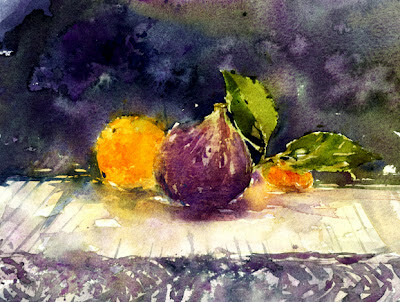 Of course this negative painting technique is useful in other types of pieces - landscapes and still lifes. I just completed week two of the Going Green online workshop taught by Vinita Pappas. 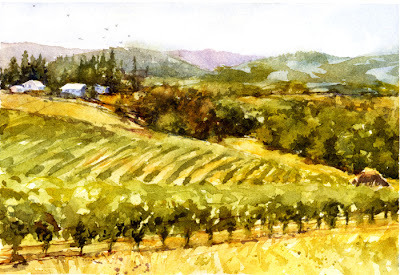 She has given some wonderful exercises to do with more of an emphasis on painting landscapes - tree types and techniques, plein air, planning steps to paint a landscape view. 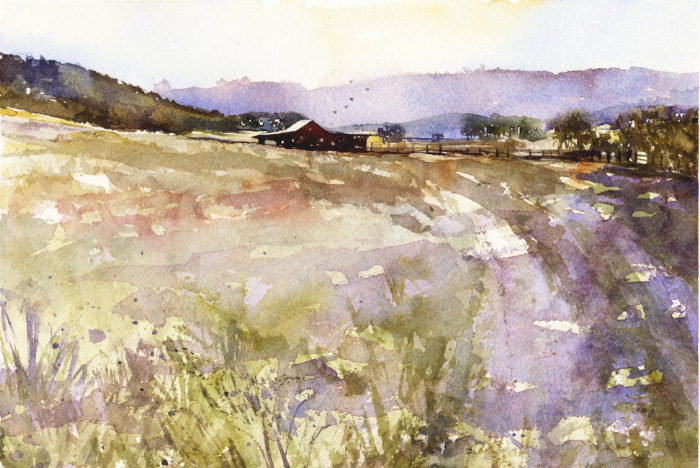 The week's final homework assignment was a simple landscape, painted from Vinita's reference or one of our own choosing. I just love the Oregon country scenery Vinita chooses. This is my try at her barn reference. I think it could use another attempt sometime. I really had fun painting it and I always learn something with each of these pieces. This is 8" x 10". It's an actual 18 foot tall silver (wooden) Fork in the Road in Pasadena, CA. It appeared on a median intersection in 2009 as a surprise 75th birthday gift for a friend from its maker Ken Marshall. Although put up without permits, its popularity allowed it to stay for a few months before it had to be removed. After getting proper permits the fork made a comeback and has become a local landmark. Now it's involved with good deeds like food and toy drives. 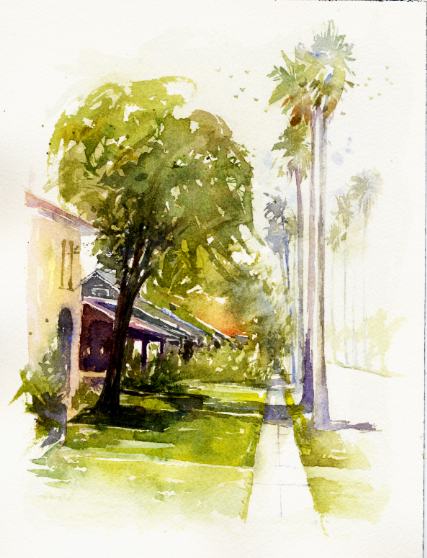 It is also a fun subject for the Saturday plein air group! Of course! Here is my watercolor, 9" x 12" including a narrow border, a photo of my view of the fork, and our painting location on the sidewalk across the street from the Fork. 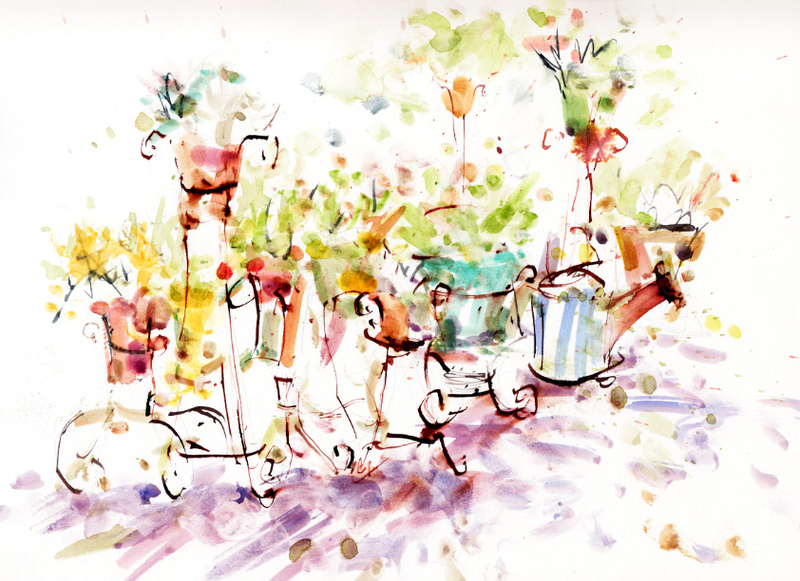 I've never painted right next to the street traffic before. Some people yelled encouragement (I think) and one fellow artist parked and came over to talk with us. An exciting morning. 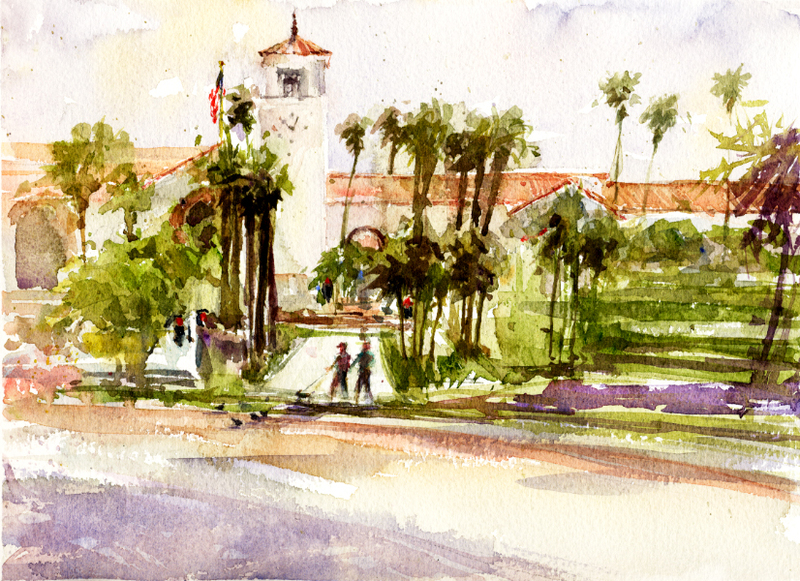 The Thursday paint-out group met at Olvera Street to paint this week. We all took light rail trains to arrive at Union Station in the downtown Los Angeles Historic District. Olvera Street is in the oldest part of the city and is a very colorful place. It's also a tourist destination and being summer I thought it would be getting so filled with people that I wouldn't be able to see the small shops to paint. Next to Olvera Street is tree-shaded Plaza Park with views of beautiful Union Station, City Hall, and Fire House No. 1. There were about 15 of us who all spread out to find our views to try. I decided on a Union Station view from across several streets. I love all the palms around it. It was a hot day and the area is filled with activity. A first for me to paint in such a busy location. Here is my piece and I'll add my photo, plus an extra tidbit. This is 9"x 12" including a narrow border. Snapshot of my view from the shady park. Since it's Los Angeles, there might be some filming going on. That was the case on Thursday in this old part of the city. There was a credit card commercial being shot at Pico House a few feet from where I was painting. City Hall in the background. I'm enjoying the online Going Green workshop given by Vinita Pappas very much. I knew I would. Vinita is such a wonderful instructor and has a very pleasant way of delivering what she wants to say. She also makes sure we get all we can out of her workshops, so she's kept us busy with lessons and homework. She has it set up so we can submit photos or scans of our work which go into a "member's gallery" for us all to see. I've really enjoyed reading the member introductions from people all over the world. Vinita said there are participants from 16 countries. The internet is amazing. Well, I'm going to share my color charts and my green sketch here. For the charts we chose 4 different yellows/ochres and mixed EACH with 5 different blues/turquoises, resulting in four charts. I got a little better at making smooth gradations as I proceeded with this. Mostly it was enlightening to see all the great grays happening which will be very useful. I need to remember how to get them. It would be helpful to do this with more colors. Our fourth lesson for the first week was a 10 minute green sketch using some green items found around the house. It's neat to see in the member's gallery what people painted. I had fun with this assignment. I am so lucky to live near the Huntington Gardens...officially The Huntington Library, Art Collections, and Botanical Gardens. The library's collection of rare books and manuscripts is extraordinary, Gainsborough's Blue Boy is on display in the art collection. It's the 120 acres of specialized gardens we visit most often. I am also lucky to have a best friend who is invited to an annual, exclusive Saturday morning tour there. And she has been able to include my husband and me. It's a very special event for us. Yesterday we had a beyond-fabulous docent-led tour of the amazing Chinese Garden, and the recently reopened Japanese Garden. 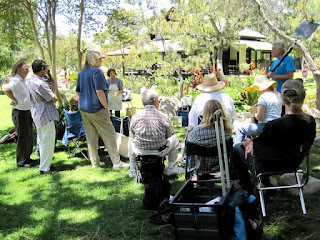 Our docent entertained us with wonderful stories of the early days of the gardens and the Henry Huntington family. When we went to this area yesterday for a photo I was shocked to see it has extensive damage from a devastating windstorm here last fall. So this is my photo from our visit last year. 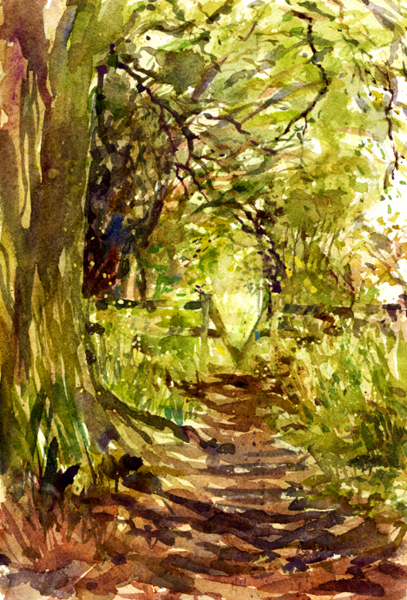 It's such a lovely walk and inspiring to paint. I'm having fun in the Vinita Pappas "Going Green" online workshop. We're doing a lot of mixing so far which is really the essence of dealing with greens. I've always been a fan of "No tube greens" and like mixing my own. This workshop of Vinita's is reminding me of the one she offered in May - "Loosening Up". This is my final project from that workshop, painted from Vinita's photo. 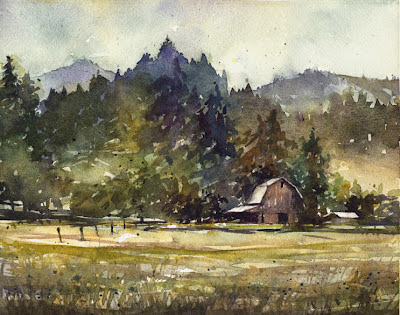 I think I need to search out some beautiful barns to paint here in Southern California. This piece is 10 1/2" x 14". 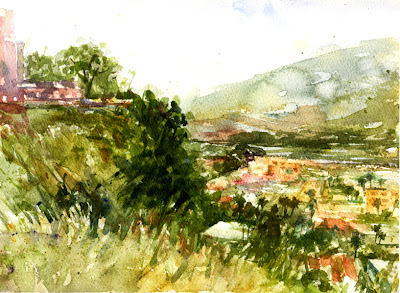 And one day last month when I felt like painting something quick, I tried this view as an ACEO or ATC which are 2 1/2" x 3 1/2"...playing card/baseball card size. I used to paint ACEOs as detailed as the greeting card artwork, but I had fun with this small piece. I'll post more ACEOs here. Vinita shared an interesting quote today from Julia Cameron, author of "The Artist's Way". Not sure I completely agree since we try to do the best we can, but it's food for thought. Here is a fun watercolor I painted last fall. It was for a challenge in a Facebook group. The group member who set the challenge rules specified no photo references, and no paint brushes. So, I went out in my backyard garden with some Q-tips, and turkey quills. Found a good twig, and fingers were excellent to use too. I really had a lot of fun painting my plant stands holding pots of succulents. And the end result is very playful. Before I look at my first lesson from the Vinita Pappas "Going Green" online workshop, I was thinking of past paintings of mine that were studies in green. 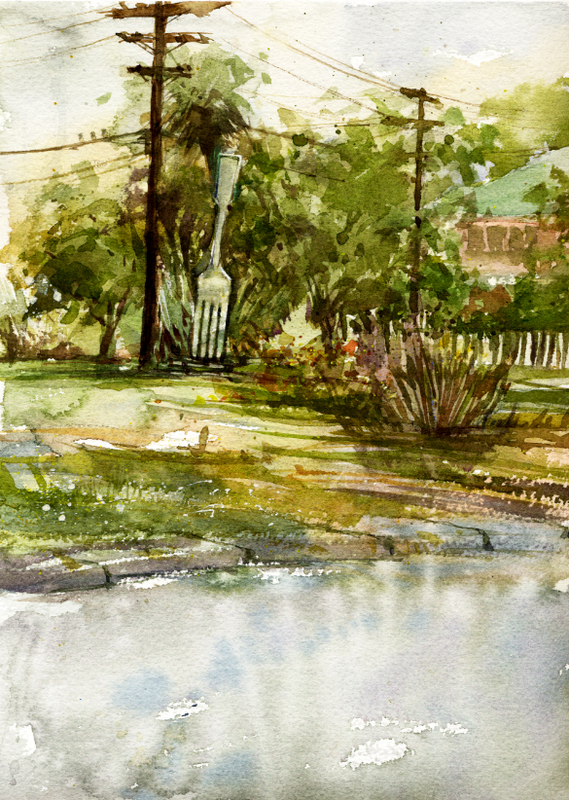 This piece was done on a paint-out with one of the plein air groups at Franklin Canyon Park in Los Angeles last month. There is a dam and lake at the location. This is the duck pond and the many ducks were so much fun to watch. It started out as a dreary day and my first wash barely dried. 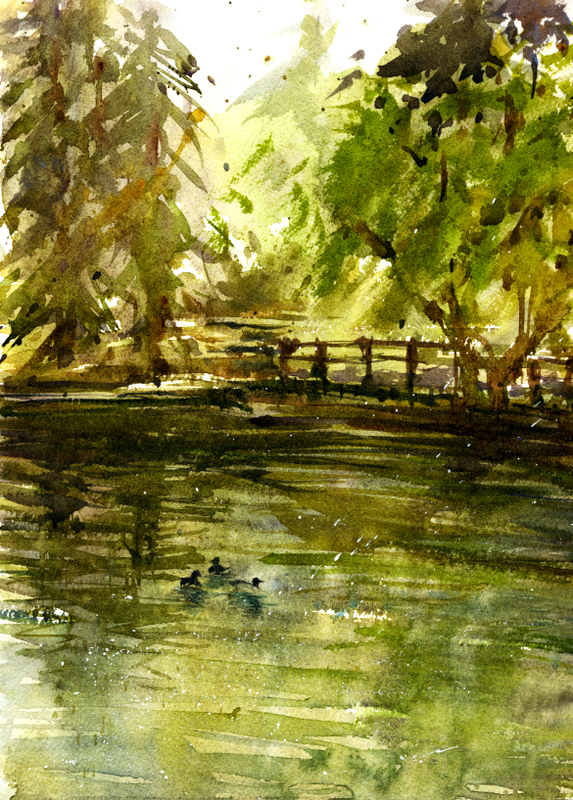 This piece didn't turn out the way I envisioned when I started painting, but ended up with a nice mood after all, with ducks. Lots of greens! This piece was painted last year and was one of the first exercises I tried on the Paint My Photo website. It's a painting with green practice which was a lesson in one of the groups, done from one of the photos on the site. This is another piece from the "7 Days in May" series. It's one of those "glaucous" succulents that appear to have a powdery coating. 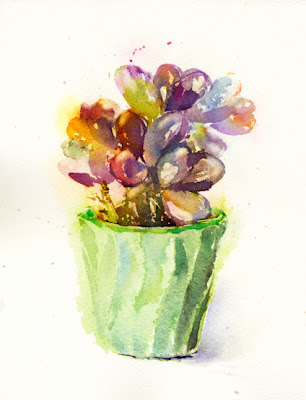 After I started trying to paint this plant I wondered if I could get the look and feel of it. Plus the vintage Bauer pot is an unusual shade of blue green. I like the way it turned out more as time away from the painting struggle passes. 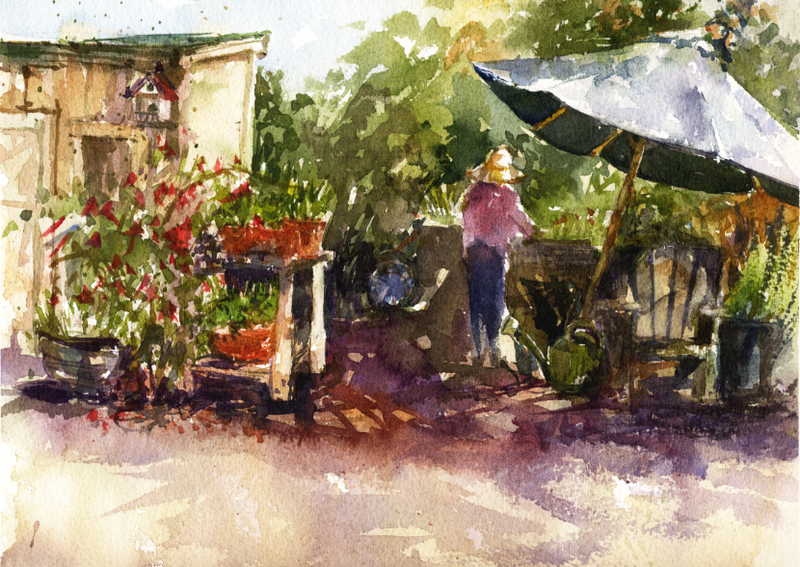 I decided to post this painting because the of the annual Cactus and Succulent Society's plant sale at the Huntington Gardens in San Marino, CA. The sale is always held near the July 4th weekend. It's a treat to add a few plants to my garden. It's also a wonderful opportunity to take some photos for possible paintings since the setting on the Jacaranda Walk is so beautiful. 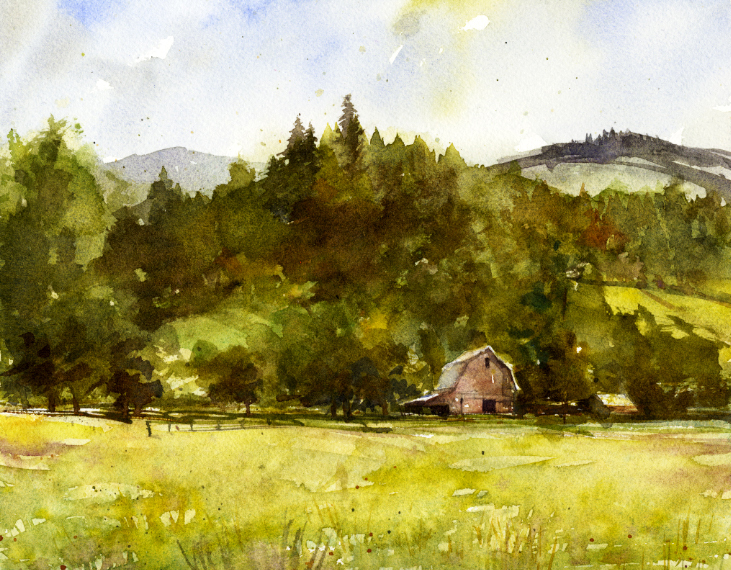 It would have been fun to try a plein air piece there! I painted this on Saturday with the plein air group. So much fun to sit under a tree and paint with some artist friends. This beautiful building used to be the grand Vista del Arroyo Hotel but is now the U.S. Court of Appeals. It features a tile-topped six story tower over looking the Arroyo Seco. Halfway through painting this I wasn't sure if it would survive its "adolescent stage" where I'm not sure if things are going well. I do like the way the palms turned out. This view probably needs another try sometime. 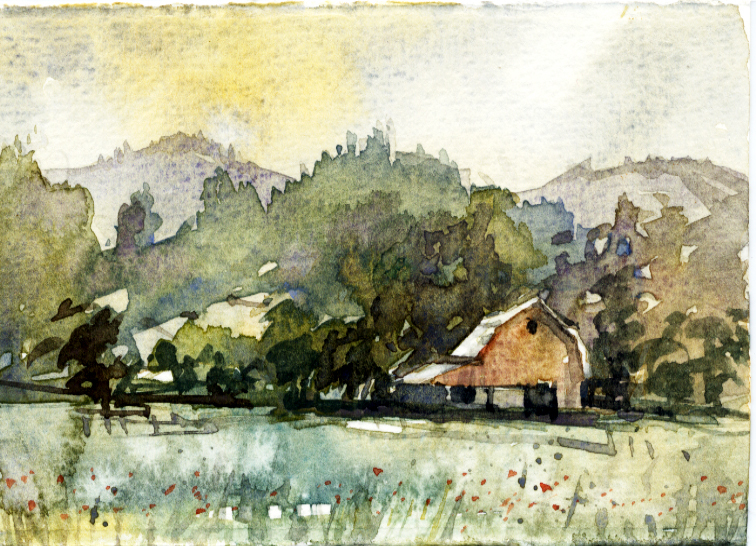 This piece is 9x12" including a narrow border. 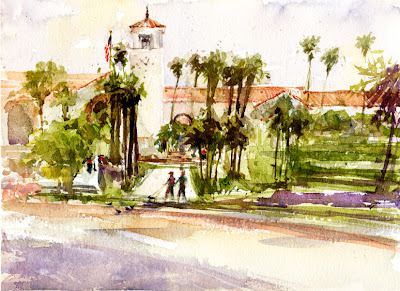 The plein air paint-out group that goes out on Thursdays has been to Glendale, CA for two weeks. We painted at Forest Lawn Memorial Park on the top of the hill. There were wonderful, hazy views all around. I wanted to try some of the view and also a little bit of architecture. There was a big beautiful church and also a small stone church. Hard to squeeze it all in and edit the view. The following week we met at the Brand Art and Music Library, constructed in 1904, a beautiful and unusual building. There was also a tea house and koi pond past the parking lot where most of my paint-out friends were. I wanted to try the architecture. Being out of the sun is a consideration. 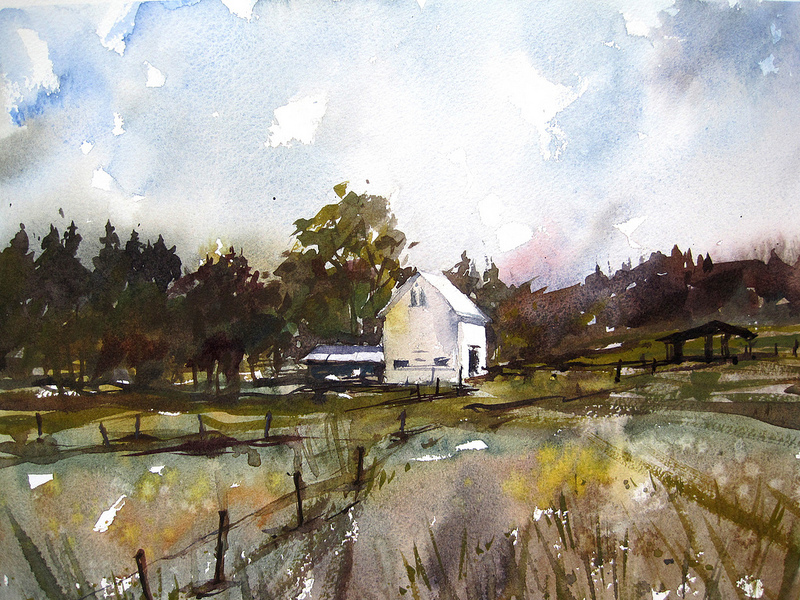 I know I need to get an umbrella for plein air painting. Summer is here. I painted both of these on a 9x12" watercolor block including a narrow border. 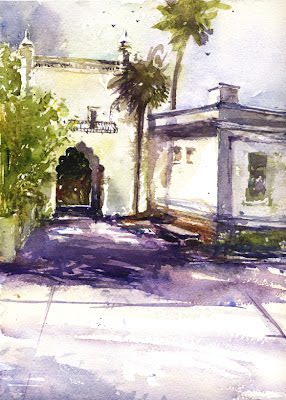 A photo of the library when I arrived to paint. It was a beautiful morning. A fun shot of most of the plein air group that day. We have fewer painters during the summer. The plein air painting group I've recently found met at Arlington Garden in Pasadena, CA last week. I painted a watercolor there in April with the Thursday group of artists so I was looking forward to finding another view to paint. It is a beautiful urban public/community garden, home to many endangered California native plants. 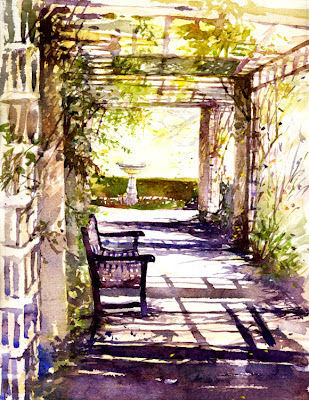 It's a place to find serenity right next to busy streets, and is a popular spot for photographers and painters. It's a great place to see what's blooming at different times of year. I decided to try painting the small maintenance shed which had some other fun things around it last week. Here is my painting and photo. 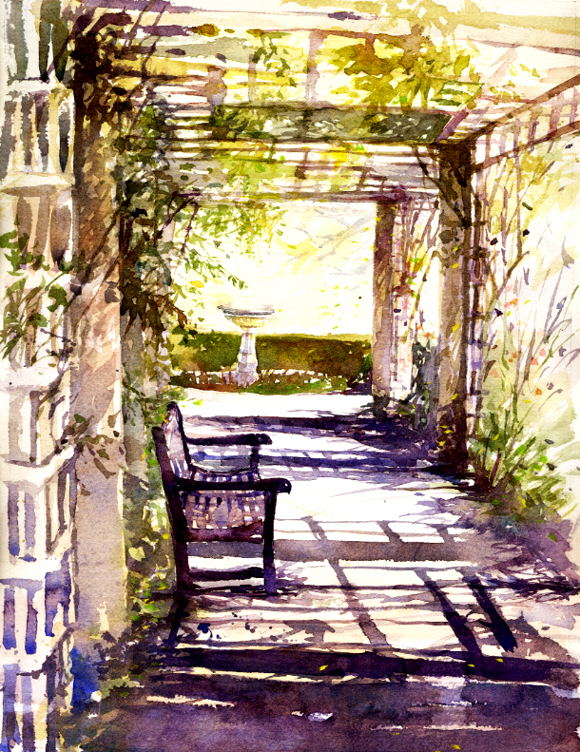 I'll also add my painting of the garden from last April. I added the figure in this painting to add interest. I'm better at painting figures now after taking a fantastic workshop from Alvaro Castangnet in April, in Fallbrook CA. What a treat that was. My photo reference of my view. This is the piece I painted in April. It was my first paint-out after the Castagnet workshop so I added figures sitting at the table. Both of these pieces are on a 9x12" watercolor block including a narrow border. I finally started to branch out from commercial watercolor painting to "fine art" pieces when I "reluctantly" signed up for an online watercolor class given by Vinita Pappas. 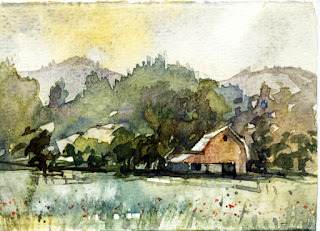 I had already been painting in watercolor for many years but it did sound like fun, something different for me. And I already knew Vinita is a wonderful artist and teacher from her free online lessons. So I took the plunge, signed up, and it literally changed my life. What a change going from greeting card sized watercolor illustrations outlined with a crow quill pen, and exacting pen calligraphy, on hot press watercolor paper. 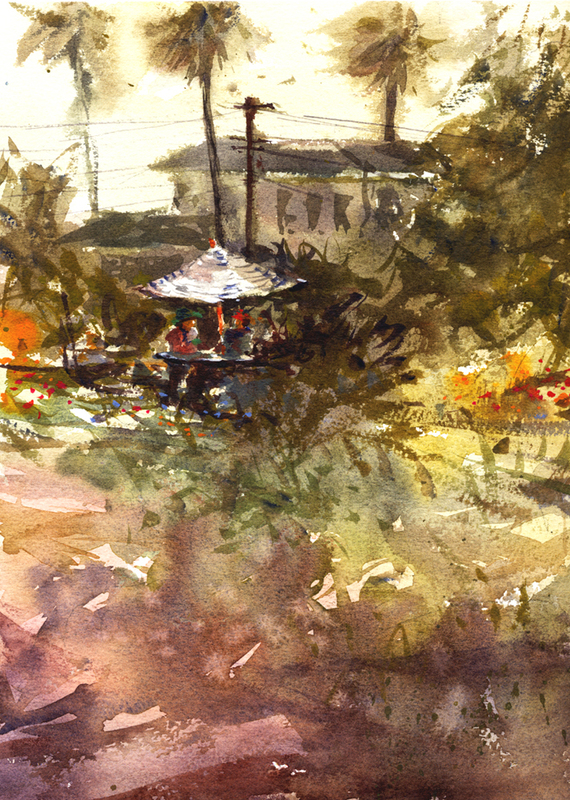 In the class it was larger sizes of course, larger brushes, rougher paper, more freedom of expression. The class has ended unfortunately but Vinita is doing an online workshop this month that I've signed up for and will report on here. I'm still learning and it's so exciting! Here are two pieces painted from references from the class. Vinita lives in Oregon which has some beautiful scenery. Just a few months ago I found out about two local groups of artists that schedule paint-outs in my area. I've had so much fun trying this and it's something I've wanted to do for so long. It's wonderful to have paint-outs on my schedule now. 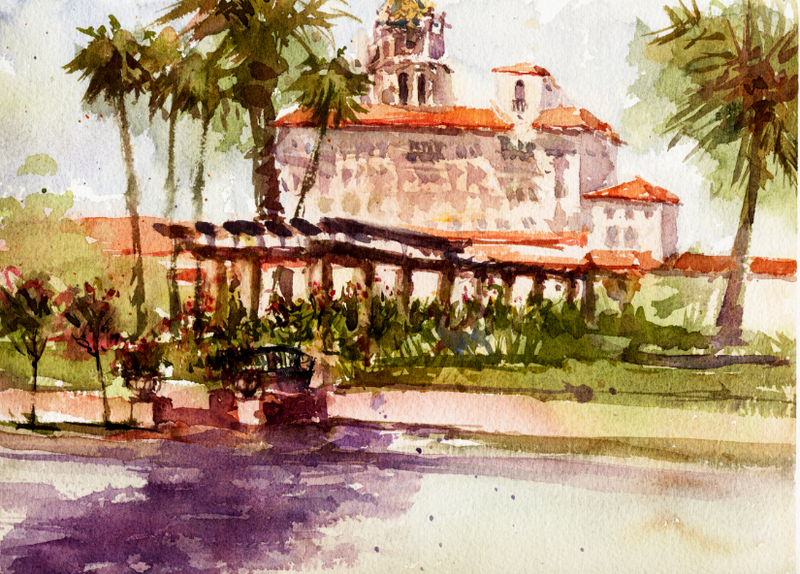 It's been exciting, and a learning experience painting watercolors on site. 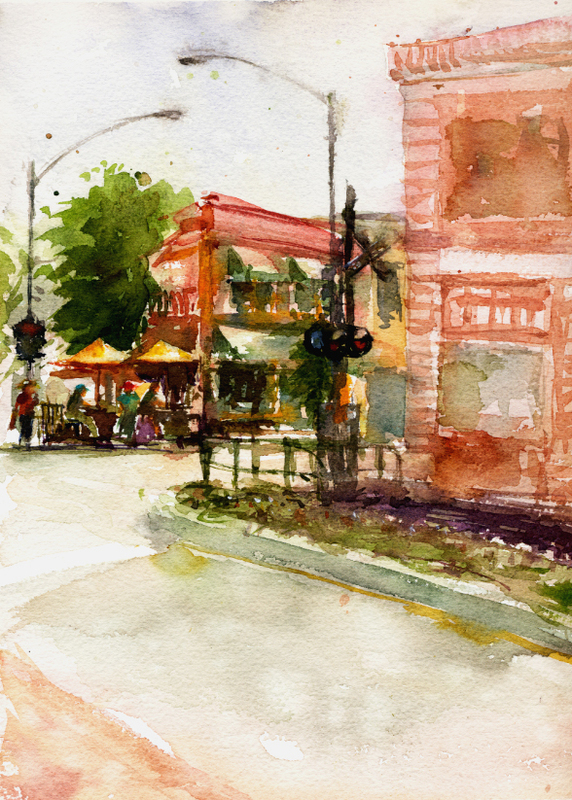 This is my watercolor of a very well known intersection in my city of South Pasadena, CA. The brick building has been painted many times by local artists. It would be terrific to have a show of all the paintings over the years. The business is Buster's, an ice cream and coffee "stop". They just had their 25th anniversary. 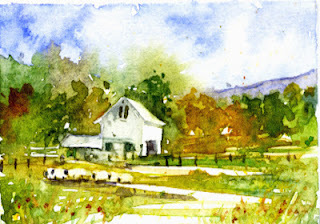 I wanted to join the plein air artists I saw painting there many times. Finally got the chance! I'm showing here my painting as well as my actual view across the street. There's a new Gold Line Metro stop at this intersection so there is always a lot going on. This is 9x12" including a narrow border. Photo of my view from across the street, under the trees. Let's start with my neighborhood! I painted this watercolor of my neighborhood for a "7 Days In May" project in an online watercolor class I was taking. It was given by Vinita Pappas, a wonderful artist and teacher. There are "Every Day In May" (EDM) projects online. Many examples on Flickr. Our street has tall palm trees as many in the Los Angeles area do. They were planted for the 1932 Los Angeles Olympics. In recent years the palms on our street have become home to a local flock of parrots, hundreds of them. When they come to roost for the night it can get very noisy but of course they are fun to watch. I really enjoyed painting this since it's so close to home!